Rolf Suey - Better Late Than Never: Invest Asia 2016 Seminar – Key Takeaways from Kishore Mahbubani et al on ASEAN! 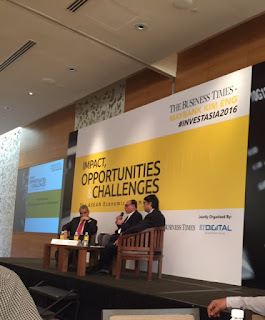 Invest Asia 2016 Seminar – Key Takeaways from Kishore Mahbubani et al on ASEAN! The ASEAN Economic Community (AEC), encompassing 10 countries and more than 600 million people, is targeted to come into effect this year. How will it change the region? What are its implications for politics and economics? What will it mean for investors? At S$38 (early bird), it is really a steal to have an event of prominent speakers in a 5-star Hotel - Grand Hyatt, with delicious good spread of breakfast, tea break, lunch and one goodie bag per person. - ASEAN the beast and the cow. - Showing some of the tremendous growth figures in GDP and Trade since 1970. GDP from 36bil to 2.6tril since 1970. - Very diverse and yet peaceful attributed to 4 letter words FEAR, LUCK & GOLF (haha)! And also some great leaders of then, LKY, SBY, Mahathir. - Geopolitical calm of ASEAN. - ASEAN is surrounded by big powers, and yet relationships externally is managed really well. If you compared to EU relationships with Russia, ME etc The key difference is EU is getting increasingly complacent and more internally focused. - Emerging middle class in ASEAN is crucial. - Biggest threat is the rivalry between numbering one rising power China and current number one power USA. - Biggest opportunity is also competition between China and USA which will bring lots of “goodies” to this region. - Very optimistic about ASEAN. Look at the track records of almost 50 years. It is always good and moving ahead. - TPP is an extremely important partnership which Singapore will be one of the biggest beneficiaries. If it is agreed, Singaporeans should open Champagne to celebrate. - Singapore is playing a critical role for ASEAN success. - Corporate Junk bonds in grave danger, some of them partly due to oil price. - China’s risks. Chinese corporations borrowed exceedingly large US$ to fund internal growth over the years, and the strengthening of USD is not doing any good. - China has significant overcapacity problems! - The poor economic outlook in ASEAN now, means opportunity in FISCAL stimulus from the government. And Asian economies had lot of room for fiscal stimulus! - Singapore market stock’s valuation is low now. Lots of opportunities. Possible downside of 15% before we hit low! - Great opportunities in Greater Mekong Sub region going ahead : Cambodia, Laos, Vietnam and Thailand. Thailand have low capital cost, Vietnam big beneficiary of TPP, and Philippines ought to resolve infrastructure problems. - Technology is key driver in ASEAN! Finding the ASEAN Alibaba, while building up the infrastructure for connectivity! How to manage a rising China? Kishore: History taught us that when a country is rising to become the world superpower, we need to be very careful and do not get into it's way. It’s like stepping into the way of an elephant. Compare to when USA was rising as a superpower many decades ago and their relationship with Latin Americans back then, China growth is remarkably competent without disrupting the geopolitical problems. Kishore mentioned that he had been invited by Beijing to talk about the mistakes China made. He was never invited by Washington to talk about the mistakes they made. It shown how incredibly fast the Chinese is reacting and learning. Another good news is China's abiding to the rules of World Organisation e.g. WTO, which the Chinese think that by obeying, they will stand to benefit. Look at the Russians on the contrary. Sadiq: There will be significant overcapacity, which is deflationary in nature. The CNY will be volatile as capital flow is freezing in the short term. The good thing is China has excess savings. And her one belt one road initiative plus Chinese capital finding investment opportunities outside China will be important for ASEAN. E.g. China overcomes the competition of Japan to build the $5.5b fast train in Indonesia. How to milk ASEAN growth? Kishore: There will be seriously more opportunities for youngsters if after graduating, go to places that is not so glamorous such as Myanmar. They may fail once, fail twice and then learn to be eventually successful with the abundance of growing opportunities in the next few decades. Kishore is very sure that the streets of Myanmar after 20 years will be similar to the streets of Thailand of today. In view of economic conditions worsening one day, risk of refugees (E.g. Indonesia) fleeing? Kishore: More unlikely was the answer. This is due to the resilient of the people in ASEAN who had gone through tremendous hardship. And most importantly as long as their homes is intact unlike in Syria where people are without home. Sadiq: Look at the sector with scalable business potential and cited that consumer products will still take the lead. If Singapore is to Choose between USA and China? Kishore: Either choice we are bound to LOSE! Singaporeans need to be alert and vigilant. We do not want to support or seen to be supporting China or USA. We want to support Singapore! Our choice has to be balance and firstly to benefit us, and then we explain carefully and reasonably our choice. Sadiq: Less optimistic for many years to come. Ultimately demand elasticity for energy will reduce. He gave an e.g that many years ago, driving an McLaren is amazing experience, but today, driving Tesla at high speed through a bend, is incredible. Kishore agreed on the wonderful experience for Tesla, since he driven one before! In addition, traditional oil production of high fixed upfront cost, lower marginal cost will also be undermined by the Shale revolution where it is more responsive helping by the lower fixed upfront cost, and higher marginal cost during production. Still, nobody can predict oil due to its cyclical nature. The fundamental challenge for companies is those that borrowed too much money in the past to go long in the commodity space. Indonesia - Jokowi before and after Presidency? Kishore: Kishore was once invited by Jokowi and was with him for hours. He was full of admiration for Jokowi how he was so capable and popular in governing Jakarta, personally attending to situations on the ground. Kishore was certain that he is going to do extremely well after he was appointed, but he was wrong. After becoming President, the best phrase to describe is “Baptism of fire!” The restraint from politics and even with Jokowi's own party, he has little control over them, not to mention the entire country. It will take some time before he get into his stride and things will recover and gain balance. 50% optimistic. The most pro-AEC (ASEAN Economic Community) are Singapore, Malaysia, Brunei and Vietnam who are in the TPP. Then followed by Myanmar, Cambodia and Laos who are adjusting to this relationship. By far, Indonesia and Philippines are least enthusiastic. There are fears that Indonesia think that their local consumption is sufficient to drive their economy? Kishore compared this to Brasil who favoured a closed economy. Brazilian always think that they are the “Land of Tomorrow!” Today Brasil is still the land of tomorrow, and not current! In view of how porous today’s world is, it is almost impossible to have a close economy to be successful. Indonesia need to learn to compete in AEC which is like a “swimming pool” before able to compete globally which is liken to be the “ocean”. Today, Singaporeans have slight advantage over China as a commonly used bridge between the western and eastern world. Looking forward, this advantage is bound to shrink as we seen and know how fast the Chinese can progress. It is a matter of time when we or our Children will definitely be unable to compete with the Chinese in their territory anymore. Therefore, in my views, it is crucial that Singaporean understand the importance of ASEAN to Singapore's survival in the next decades to come. Not just understand, but prepare for it, and finally react to it in a positive manner. From year 2007 and before to 2012, I had travelled/managed extensively SEA regions such as Indonesia, Vietnam, Malaysia etc. The last three years, my focus had been in China where I spent so much time there and luckily for me, also did obtain some small success. Now that China is slowing, and there exist re-organisation within my company, my focus is going to be ASEAN in the next 3 years. Not only can this focus be beneficial for my company, but also for my own exposure in this extremely important region of the future.